The Product is Fantastic, Arrived Quickly and it is better than i thought . Easy transaction. Great product. Thanks. It's great, but it's big. Perfect speaker for group situations outdoors. Sound quality is great and bass kicks so much harder than other Bluetooth speakers. It's not a take anywhere speaker though. It's heavy and bulky and you will probably require a 2nd smaller speaker as your pack and go (for me UE megaboom). Also the bass penetrates walls a little too easy so if you live in apartment complex do your neighbours a favour and don't use it inside. All of the main things are great though, volume, sound quality, ruggedness, battery life, range. It's perfect at what it is. Just consider if what it is, is what you're looking for. Excellent sound quality and power. I highly recommend this speaker. 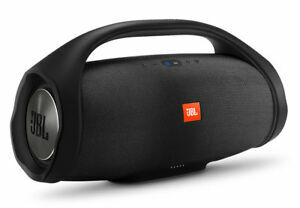 I already had the JBL Xtreme, but this surprized me. WOW! This is amazing! If you’re willing to pay the cost I assure you it is worth it. This is definitely a nice speaker that gets very loud. It has good high pitch sound/ crystal clear sounds . I’m sooooo happy with my Boombox. Worth the money by a long shot. Great product and would buy again! Went camping with it. It charged about 4 phones and played music for about 3 days before it finally ran out of battery. The waterproofness made it easy to clean the sand and dirt off of it but it is quite pricey. For what you get I think it's a fair price but it is still a lot of money. Overall a 4/5 star review. This is a big and heavier-than-you-expect speaker. The battery runtime is incredible given that it’s capable of making neighbour-calls-the-cops output levels. It floats in water too - just make sure you balance it so the speakers face upwards - making it pretty much the perfect summer pool party machine. The only downside? The sound.. my Harman Kardon Go+Play sounds several grades more refined, but falls way short on SPL and battery life. But for perspective, the sound quality and SPL is on par with the Marshall Woburn, but the BoomBox does it on battery power and is pool friendly. 4 stars. My JBL Extreme 2 doesn’t even come close to the sound of this thing. It’s big, loud and thumps with ZERO distortion. 24 hour battery life with 2 USB chargers and completely waterproof. This is the only speaker you’ll ever need. Love it!